We were up early again to see the sail in to Buenos Aires. The alarm went off at 6.30 and Martin was off to the forward deck like a shot. I followed on slightly later. We had had a pilot ship with us since yesterday evening as we had to travel around 100 miles up the mouth of the huge Rio de la Plata - River Plate - to reach BA. Argentina is on one side of the river and Uruguay on the other. In the harbour the ship had to turn around 180 degrees and then it was pulled backwards by a tugboat into the port to get to the berth. There were a couple more huge cruise ships already in the port and another followed us in. Sadly another death overnight, a lady this time apparently. Two people also left the ship in ambulances and secondhand we heard that one of those was a lady of 53 who'd had a stroke. Nothing is ever officially announced, but it obviously gets around eventually. After breakfast we went into BA via the shuttle bus through the port. It was a really hot day again, the skies were blue and the sun was shining brightly. We hadn't booked any excursions and were going it alone today. We had 6 hours walking around taking in a few of the places of interest - The Plaza de Mayo (the main square in BA), where we saw the Government House and the Metropolitan Cathedral (from the outside) - but generally enjoying just being there. In the Plaza de Mayo is a war veteran who has been living in a tent under a tree for 26 years in protest of how Argentina treats its war veterans. We saw the camp but didn't know why it was there until we got back. In one of Clive's talks he suggested passengers ask an Argentinian what they thought of the Falklands War! One lady asked her taxi driver and he said the ordinary people did not know about the Malivinas (Falkland Islands) until war was declared in 1982, and, even after they didn't care about them either. It was just a political war of principles. A lot of BA was built using British investment in the early 20th century as it was well located to control all trade in the region, and is very like central London with big, tall, ornate block buildings. Once it had a Harrods - the only other ranch outside London - but the building, although still there with all the signage, is now derelict. The streets in the central shopping area of the city were crowded with people and there was lots of bits of paper/litter flying around the gutters. Many of the roads were very wide with several lanes of one-way traffic. They all had pedestrian traffic lights to cross the roads and depending on how wide the road was, would count down from anything between 30 and 10 seconds to let you know how long before the traffic would move again. We stopped for a while in Cafe Iberia where the interior had an Art Deco feel to it. There were several pictures and descriptions on the menu of its history incarnations over the years, but it was all in Spanish so I was none the wiser. It had wifi so I was able to get a couple of blog posts done but the signal was weak so it took a while - a cup of coffee outside and another inside, where the signal was a little better. Then we made our way to the Recoleta Cemetery - this mini city of tombs, statues and sarcophagi houses Argentina's past presidents, military heroes, politicians and the rich & famous, including Eva Peron - Evita. BA is the birthplace of the current Pope, Francis, former Archbishop of Buenos Aires - I wonder if he will be there eventually, or do they bury the Popes in the Vatican? 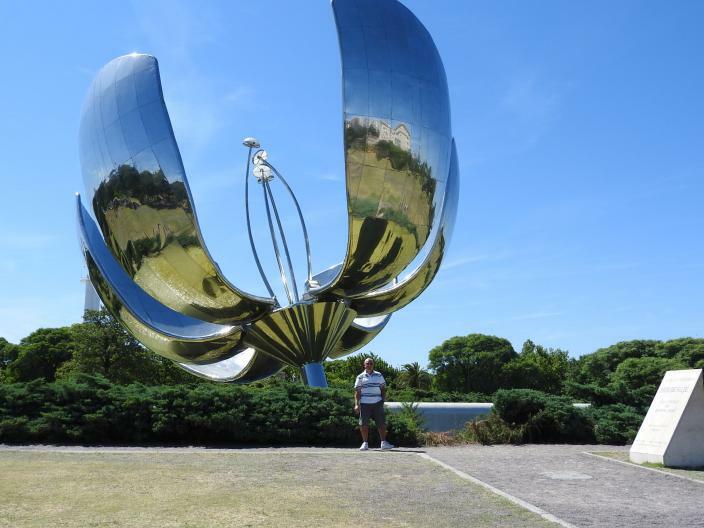 Our feet were beginning to complain so we made our way back to the terminal via a park with a huge shiny silver metal sculpture of a flower that looked like a buttercup. The 20 metre high (60+ft) structure opens and closes its petals at 7.30am and 8.30pm respectively using a 'hydraulic system and photoelectric cells' (solar power?) and was very impressive and very pretty. We got to the terminal hoping to use the free wifi before getting back on the ship but had no success connecting again. We sailed away from BA at around 7pm with the sun going down behind the city's skyscrapers strung out along the horizon.